Hi everyone! I’m Lauren and I blog over at Sassy Sweetheart. I’m so glad Kriselle let me take over for the day to share with you one of my new favorite series! I picked up Delirium by Lauren Oliver without having any idea what I was getting myself into. Honestly, I just knew I had seen it places before so I figured if other people liked it, I might too. Spoiler alert: I did. I was immediately hooked. What I really loved about this story was that Oliver makes the world her characters live in so believable. Not only does it focus on the elimination of romantic love, but also more platonic love. Friends don’t greet each other with hugs and parents don’t comfort their children when they fall. I can’t imagine living in a world where relationships don’t mean much, which made this whole concept that much fascinating to me. The first half of Delirium drags on a little bit. Lena starts out counting down the days to her cure. She can’t wait to be cured because she believes in her government’s ideas. She truly believes that love is a disease. Lena gets upset when her best friend Hana listens to unauthorized music and wants to go to forbidden co-ed parties. Even when Lena meets Alex, she still firmly believes in the process and tries to ignore him. It isn’t until Lena starts to form a real relationship and romance with Alex that things start to pick up and get interesting. Lena has to make up elaborate lies to be able to get out of the house to see Alex. And when Alex tells Lena about life in “the wilds” outside of all of the government regulations, she starts to contemplate running. I found myself initially annoyed with Lena for believing so firmly in her government, despite the fact that she had no reason not to. But after Lena meets Alex I found myself rooting for her and their love. Lena doesn’t let Alex take care of her. She is strong, independent, and so brave. She’s not the typical damsel in distress who needs a man, but instead learns from Alex as an equal. The ending is such a cliffhanger. I immediately started Pandemonium when I was finished because I couldn't wait any longer to find out what would happen to Lena. I don't want to spoil anything for you by telling you about Pandemonium, but I will say things start to get very interesting when we're not in Portland anymore. Bottom line: You'll love this series if you love Hunger Games, The Selection, or Matched. 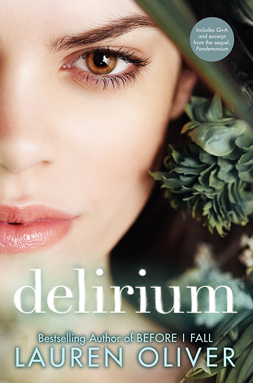 After you start to get into Delirium, you won't be able to put it down!